Medicinal uses: Well known for its soothing and calming effect. It is commonly blended with other sedative herbs to relieve sleeplessness, irritability, headaches, and migraine. It also helps to alleviate depression. This plant soothes indigestions and colic and relieves gas and bloating. Its relaxing effect makes it helpful for some types of asthma especially where excessive nervousness is a feature. The essential oil is an exceptional first aid remedy. It is strongly antiseptic, helping to heal burns, wounds, and sores. It can be rubbed on insect stings and can be used to treat scabies and head lice. It relieves pain and inflammation. A few drops of the essential oil can be rubbed into the temples to relieve headache and to encourage sleep (Chevallier 110). Additional uses: It’s exceptional fragrance and ease of drying make this plant an exceptional addition to dried flower arrangements and to potpourris. 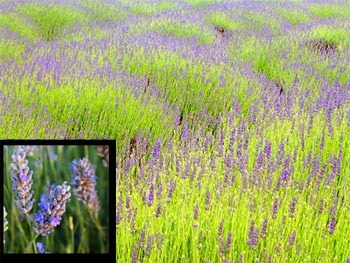 Vinegar steeped with lavender is reported to be very useful for oily skin (Kowalchik 351). Cautions: Do not take essential oil internally (Chevallier 110).